Fujitsu has produced a lot of first-rate subnotes over the years, but the Lifebook UH572 is a shaky start to its Ultrabook endeavors. While it looks good, boasts a nice webcam, and packs a roomy hard drive, this 13.3-inch portable disappoints on several fronts. 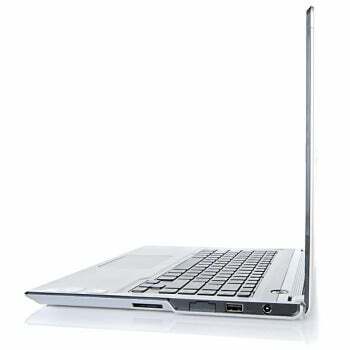 Although reasonably priced at $999 (as of July 5, 2012), the consumer sibling of the business-oriented Lifebook UH772 delivers decidedly subpar performance. Even with one of the new Ivy Bridge CPUs—an Intel Core i5-3317U running at 1.7GHz—the UH572 did poorly in our WorldBench 7 test suite, turning in an overall score of 97. That's on the low end for notebooks in its ultraportable class, and likely reflects the unremarkable nature of the rest of its configuration: 4GB of memory, standard Intel HD4000 graphics, a 500GB 5400-rpm hard drive, and the 64-bit version of Windows 7 Home Premium. While the UH572 did okay on certain parts of the benchmark—startup and content creation scores were on a par with other Ivy Bridge Ultrabooks we've seen—it stumbled badly in the PCMark 7 Productivity Suite and storage components. I blame the pokey hard drive, which together with the HD4000 graphics--unassisted by a discrete GPU--probably also contributed to lackluster gaming scores as well. Battery life was also unimpressive, clocking in at 4.5 hours—not the worst we've seen but a couple of hours shy of the best performances. Factored in with the rest of the UH572's test scores, it produced an overall performance rating of 67; by way of comparison, the models on our current Ultrabook chart all scored in the high 70s or low to mid-80s. If industrial design contributed to the score, the Lifebook UH572 would have done better. From its brushed silver magnesium alloy cover to its smooth black interior with blue lighting accents, the UH572 looks like a class act. The case remains cool after several hours of operation, and the unit’s 4.1-pound weight (including charger) is mid-range for the screen size. The widescreen (1366 by 768 pixels), LED-backlit display is bright and crisp. The laptop supports Intel's Wi-Di technology for beaming a notebook display to a TV that also supports Wi-Di, but you need to plug in a Wi-Di adapter to use this feature. Fujitsu outfitted the UH572 with two USB 3.0 ports, including one that can charge devices even when the laptop is powered down, and one USB 2.0 port. 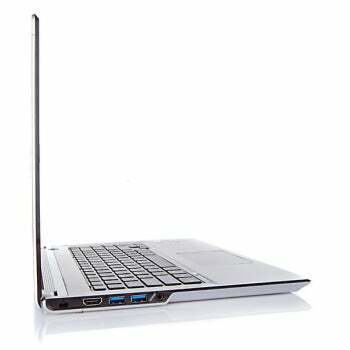 The laptop also has HDMI-out and security lock ports, and an SD/Memory Stick card reader. But I found puzzling the company's decision to leave out ethernet support, an omission all the more glaringly obvious as a mini-LAN port appears on the UH772. Surely some consumers would like a wired network connection as opposed to 802.11n Wi-Fi on the 2.4GHz band only. The keyboard is also problematic. The island chiclet-style keys are middling in size—there’s almost an inch of platen on either side—but although they’re reasonably well-spaced, they’re also a bit slippery, travel is minimal, and the keyboard has no backlight. The layout isn't optimal either: Fujitsu chose to put the Home, Page Up/Down, and End keys in a column on the far right, and as a result both the Backspace and Delete keys are less easily accessible than I’d wish. The Synaptics ClickPad (version 8.0) touchpad has its good points once you get the hang of it. Because the cursor keeps moving after you swipe it, you can get to the right or left edge of the screen in one go—or maintain more control by keeping your fingertip firmly on the smooth, button-free surface. The ClickPad also supports multitouch gestures such as pointing and zooming. But I did miss having dedicated buttons for right and left clicking, as opposed to clicking the entire touchpad on one side or the other. In the end, this comes down to personal preference. The speaker system is another major downer. Even with the DTS Boost technology and volume controls at the maximum setting, the audio was tinny. Audio with a headset was much better, but not especially great—music lovers should look elsewhere. The UH572 did well with video, however. YouTube videos looked smooth, and the built-in high-def (1280 by 800 pixels) webcam captured good-looking video in a Skype call to China. Fujitsu's software bundle is minimal, but it avoids the most annoying bloatware and includes a couple of potentially useful applications: Cyber YouCam software for creating videos with the webcam, and Roxio Creator LJ, a stripped-down DVD burning application. You also get the usual trial version of Norton Internet Security and Microsoft Office Starter Edition. Had Fujitsu given the UH572 ethernet support and a more robust audio system, I could forgive the unimpressive performance—after all, most consumers won’t be running heavy-duty spreadsheets or doing serious video editing. But general users do care about decent multimedia and a good keyboard, and Fujitsu’s attention to industrial design and components fell sadly short in those areas, making it difficult to heartily endorse the UH572. The Fujitsu Lifebook UH572 looks cool and is reasonably priced, but performance and other key features disappoint.